"Oi Noah, wait for us." "Who put the Tigers in the tank?" Having just found the shark up a tree, fears were growing that the head keeper may be suffering from dementia. After the doping allegations, the Russians decided this was the only way to get their athletes to break the Olympic swimming record. "Mr Bond, I'm not crazy. I just like feeding my enemies to my angry wet tigers." It's not recommended to go paddling in Tiger's Bay. Tiger: "The water's lovely. Come on in, Clarence." "Darling, I think you've gone a bit extreme this time protecting your koi carp." "It's working though ,isn't it." Pi! It's me, Richard Parker! Let me and my mate back aboard! "Come on jump in we fancy soup today"
Well you must of heard of Sea Lions so why not Sea Tigers. 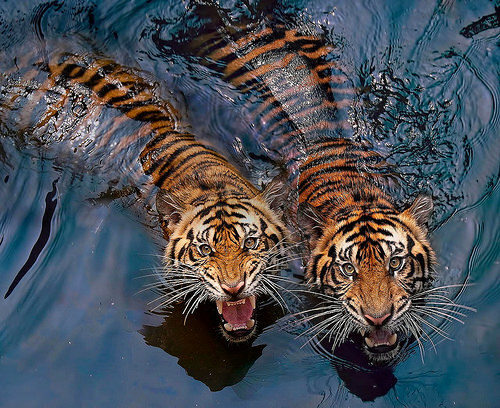 "I overheard William saying 'Tiger tiger burning bright..' so thinking they were on fire I shoved them in the pool?" "Peter, can you come into my office please. We need to discuss that picture I asked you to source. I'm not convinced this is the river Tiber." "Darling, you know those tropical tiger fish you bought yesterday"? ?